A GOAL in the 48th minute by Katie Power finally separated Kilkenny from a Galway side that left nothing in the tank but for a third consecutive season, bowed out of the Liberty Insurance All-Ireland Senior Camogie championship at the Semi-Final stage, having been within a puck of the sliotar of their conquerors. Kilkenny will be hoping that the trend of the unlucky Tribeswomen losing to the eventual champions will continue and it was significant that they added three quick points from Denise Gaule (two) and Meighan Farrell to stretch their lead to six. There was some late drama as Rebecca Hennelly drilled a penalty to the net in the fifth minute of injury time to give Galway hope but a stunning catch by Gaule from the westerners’ last attack ensured that it was the League champions and the 2017 Championship runners-up that would prevail. Kilkenny were dealt a blow even before the throw-in when Miriam Walsh failed a late fitness test. As expected with Walsh being replaced by defender Edwina Keane, who missed last year with a cruciate knee ligament, the three-time All Star moved back to corner-back where she excelled, leaving Tara Kenny loose in the Galway defence. It was similar at the other end as Galway withdrew Niamh McGrath and Noreen Coen deep, leaving Catherine Foley in splendid isolation at the other end and Anne Dalton directly marking Catriona Cormican on the 45, though Meighan Farrell dropped back when Galway had possession. It meant space was at a premium and defences held sway, with some magnificent hooking and blocking on display, though some dreadful shooting contributed to the low scoring in the first half. The game never really took off as a result and though the humidity may have had a part to play in that too, too often intended passes did not reach their intended targets. Galway began well, had a point from a free by last year’s Minor star Carrie Dolan and might have had a couple more, as Niamh Kilkenny, Ailish O’Reilly and Dolan looked threatening. Kilkenny took control for 15 minutes or so thereafter and might have had a couple of goals, one overhit pass denying them a gilt-edge opportunity, though Sarah Healy showed an excellent touch to complete the clearance. Soon after, it took a fantastic block from outstanding captain Sarah Dervan to deny Michelle Quilty a certain goal. Two pointed frees from Gaule put Kilkenny ahead and she was astray with three other of other good opportunities. After Quilty pounced on a loose clearance to stretch the lead, Kilkenny took a pass from O’Reilly to find the target and then the full-forward was fouled for Dolan to equalise. Kilkenny hit the front with the score of the game, as Anna Farrell took a pass from Gaule and then drew the cover before batting the ball back over her head for Katie Power to find the target. Farrell provided the assist also for Julieanne Malone and it was 0-6 to 0-4 at the change of ends. The sides were level within eight minutes of the resumption as Dolan converted a couple of placed balls, the first after just 39 seconds of action. The staccato nature of proceedings continued but Galway were assuredly on top and Dolan, landed a free from wide on the left and outside the 45 to give Cathal Murray’s crew the lead. Malone equalised and then started the move for the goal that was always going to be significant in such a tight encounter. She did well to gather possession, and get the chain under way. Davina Tobin and Shelly Farrell were also involved, leaving Power to steal in and take the final pass, giving Healy no chance with a hand pass to the net. Galway brought on Siobhán McGrath and Niamh Hannify, with the latter sporting a very heavy strapping on the knee injury that kept her out of the Quarter-Final. 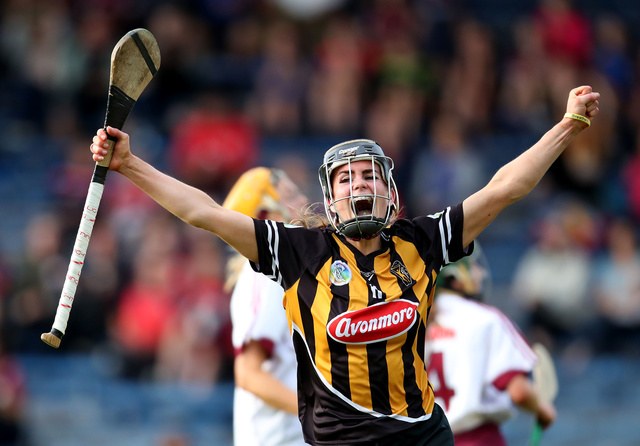 Kilkenny introduced Walsh but though Galway kept battling, with O’Reilly in particular continuing to take the fight to the Cats, it was Ann Downey’s side that established the significant advantage to see it home.